MLB closers, we’re officially putting you on notice. Simply walking out to an intimidating song isn’t going to cut it anymore. With one video, Los Angeles Angels closer Hansel Robles has changed the game. 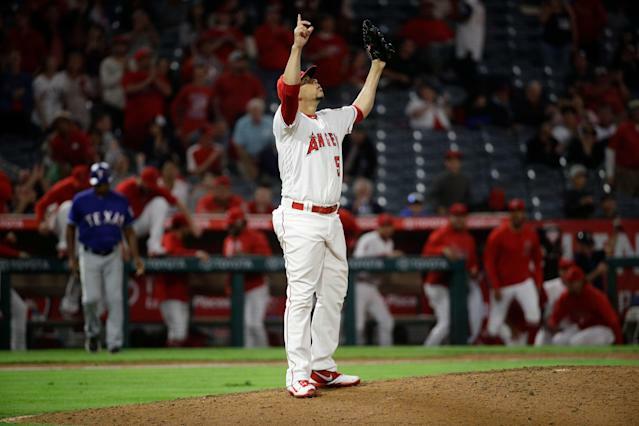 The Angels revealed a primitive version of the video during Wednesday’s game, in which Robles picked up his first save of the season. On Thursday, they hit Angels fans with the completed masterpiece. That’s the video that will play when Robles enters games from now on. Wrestling fans might notice the Undertaker’s theme in the background. The video also features candles, rose pedals, a white horse, the moon and a picture of a black hole. What does it all mean? We’re glad you asked. Robles’ explanation of the imagery only adds to its brilliance, according to Cut 4. Robles, speaking to the media after the game with a white bandana over his head that he said was like Rambo’s, did his best to explain his introductory video. He said he’s a huge fan of The Undertaker before pretending to rip off his shirt. “The White Horse, that’s my nickname,” Robles said through a translator. As for the slow-mo of his white shoes that kept repeating throughout the video? “Because that’s how horses walk,” Robles said matter-of-factly. “It’s always burning,” Robles said. That right there cements this as the best closer entrance of all time. You can still respect the classics like Mariano Rivera’s “Enter Sandman” and Trevor Hoffman’s “Hells Bells,” but those didn’t include videos of a white horse running through a meadow. Robles’ video is almost Lynchian in its complexity. Dusty Baker would love the heck out of Hansel Robles.